December 2014 – Isn't That Marvelous? This is the second installment of my four-part series, reviewing the recipes I tried for the first time this holiday season. In Review 1, I covered Christmas Spice Cookies, Whiskey Caramel Sauce and Candied “Limoncello” Peel. Now, let’s take a look at Cinnamon Rolls with Cream Cheese Icing, Breakfast “Cupcakes” and Blueberry Lemon Bundt Cake. Listen, I don’t want to pat myself on the back or anything, but these things were freaking amazing. Neither my husband nor I could stop eating them. We had a slap fight over the last of them. That said, these suckers are not quick, easy or low in calories. So, this is definitely a special-occasion recipe. But, holy cannoli, so worth it. I did not alter anything about the recipe for the rolls themselves. In fact, I followed the recipe to the letter, because this was one of my first attempts at working with yeast that didn’t involve an actual bread maker. The only deviation was the milk – I didn’t have a full quart of milk, so I used heavy cream and about 1/2 cup of buttermilk. Given the results, I would do it again. Can I say also that any recipe calling for “punching” anything as part of the prep is a winner in my book. I left the dough in the fridge overnight. In the morning, it had risen considerable. I did, in fact, punch it. Cathartic. Especially at 6:00 a.m. on a vacation day. When I sliced my rolls, I got 18 rolls from the first log of dough and 16 rolls from the second. The recipe states that each log should yield 20 – 25 rolls. I think you’d either have to roll the dough too thin or cut the rolls too thin to get that yield. I rolled the dough to about 1/4″ thick, and I cut the rolls about 3/4″ thick. For the baking, the recipe recommends placing the rolls in pie pans, but I didn’t have enough handy, so I put the rolls into 9 x 13 baking dishes. I tried not to pack the rolls in too tightly, but they were touching. The effect was to increase the cooking time from 18 minutes to about 25 minutes. I took them out when all the rolls had a nice golden brown top and the butter on the sides of the pan was bubbly. The centermost rolls were slightly doughier than the outer rolls, but they were not undercooked. The different was due I think more to the butter on the sides of the baking dish touching the outer rolls, giving them a crustier outer texture. The thing I really altered from the recipe was the icing. Maple is not one of my all-time favorite flavors (except on pancakes), and it’s hard for my taste buds to imagine anything other than cream-cheese-laden icing oozing off a warm ball of doughy, buttery, sugary cinnamon. For the cream cheese icing, I whipped about 1/2 cup of cream cheese until smooth, added 1/2 cup of milk and 2 teaspoons of vanilla and whipped until blended, then I added powdered sugar in 1/4 cup increments until the icing was thick but still pourable – probably somewhere around 1 cup. Ultimately, this was enough icing to cover both pans. If you have more than you need, store it in an airtight container in the fridge. We baked one pan of rolls that morning. The second pan we put in the fridge, still covered with a kitchen towel, for two days. Equally good after baking. Breakfast “Cupcakes” (adapted from The Cooking Jar) Unlike the cinnamon rolls, these little delights are easy. They also provide a handy way to serve bacon, eggs, cheese and hash browns like a finger food. Really press the hash browns into the tin sides and bottom. You aren’t going to need a really deep “cup,” because the egg will ooze a little into the spaces between the potato. I don’t particularly care for runny egg yolk, so I scrambled eight eggs together with a little milk, salt and pepper, then poured the mixture into each cup until it was level with the pan. Baking time was equivalent, and the added benefit was that the eggs rise, making the whole think look just like a cupcake. This would be a great time to show you a photo … if I’d been smart enough to take one. Ahem. Remove the “cupcakes” from the pan right away to avoid sticking. I used a small frosting spatula, which worked well. Serve immediately. Cold eggs get rubbery, which is gross. We had two “cupcakes” left over, so I threw them in a zipper-seal bag and refrigerated them. I reheated them the next day using the toaster oven set at 350 F. Took about 10 minutes. Still good. I do NOT recommend using a microwave to reheat. The hash browns will get soggy and eggs rubbery and it will smell good but taste like a mouthful of horrible, and you will be upset AND hungry (= HANGRY), which just is not how you want to start a morning. So I’ve heard. 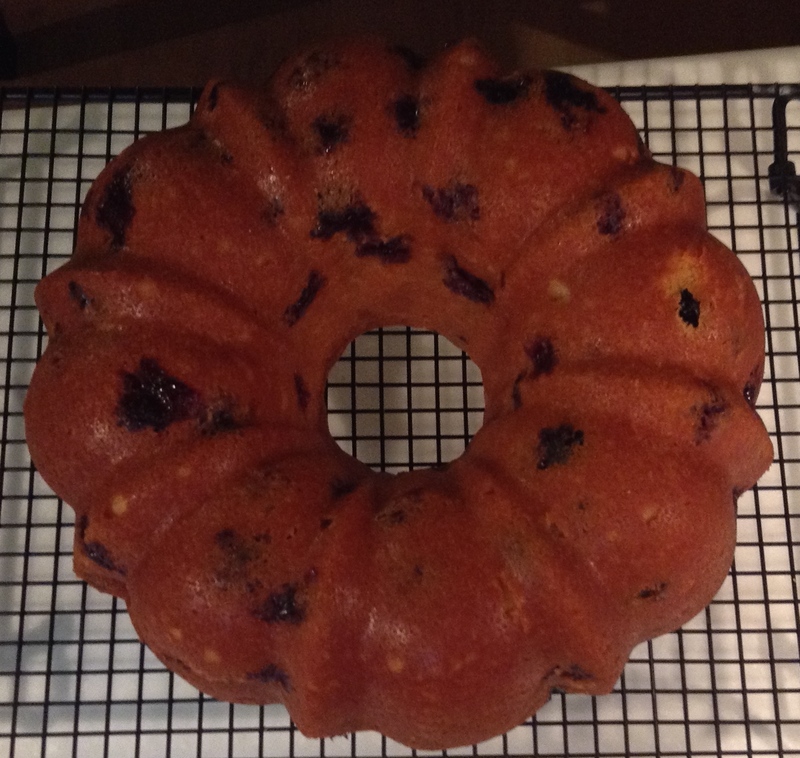 Blueberry Lemon Bundt Cake (adapted from Martha Stewart) Oh, Martha. Martha, Martha, Martha. I want to hate you, but then you put out little gems like this. Blueberry muffins are one of the best inventions ever (says the girl who has an unrivaled carb addiction). Pound cake is one of the best inventions ever. (CARB. ADDICTION.) This cake is what happens when blueberry muffins and pound cake collide into a spectacular lemony, moist, dense, flavorful break-ssert. Right from the oven – a beautiful, golden-brown crusty top. Bundt pans are unforgiving little bastards. If so much as a crumb gets stuck in the pan when you invert the cake, it’s hard to fix the blemish. So, I recommend prepping your bundt pan with nonstick spray, which will ensure you get a good coat in every crevice. Pay special attention to the inner circle of the pan, all the way up to the rim. This is where many a bundt-cake-dream is crushed. Follow the directions for cooling the cake before inversion carefully. No one likes a cake decorated with the salt of your tears. If you make this cake ahead, I suggest serving the slices slightly toasted and dressed with a pat of butter. You’re welcome. It’s been a while since I’ve posted anything, but that’s only because I’ve been extra busy in the kitchen! I had big plans for an epic Thanksgiving post, but that will have to wait until next October. (One of you needs to remind me before Halloween, thanks.) In the meantime, though, I wanted to share with you what I made this Christmas to give away as gifts and for noshing on Christmas morning. 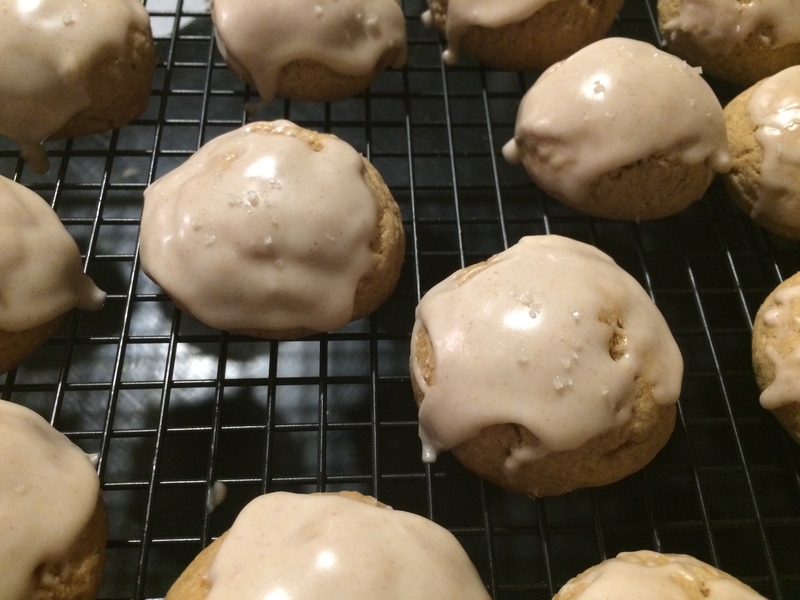 In this post, I review results for Christmas Spice Cookies, Whiskey Caramel Sauce and Candied “Limoncello” Peel. Review #2 will include Cinnamon Rolls with Cream Cheese Icing, Breakfast “Cupcakes” and Blueberry Lemon Bundt. Review #3: Spiced Pear Vodka, Liquored-up Lollipops and Caramel Bourbon Sauce. Then, Review #4 will wrap up the series with Gin & Tonic Truffles, Chocolate “Munchkins” and Dark Lemon Cordial. I was out of vanilla beans (you’ll see why below), so I substituted vanilla powder in both the cookies and the icing. I chose the powder instead of the extract because it does not alter the color of your dough and I thought it might be a little more intense flavor wise. I don’t think the substitution left the cookies lacking in flavor. Vanilla beans are really expensive, so if you want to make this substitution to save cost (especially if you’re making these in large batches), you should be okay. Take the recipe author’s advice about letting the dough sit so the flavors develop. I did not with my first batch, because impatient. There was a noticeable difference in the intensity of the flavor in the second batch, which did sit. I did not add the all spice to the icing, because that felt like overkill to me with the great flavor of the cookies. Instead, I doubled the cinnamon to two pinches. This made the icing a little darker (to the brown side) than it appears in the pictures, but it really complemented the cookies well. I did not make the vanilla sea salt. Instead, I used gray sea salt, which I love. This was just personal preference for me. I love vanilla, but vanilla in the cookies, the icing and the salt seemed like overkill. The beauty of these cookies is the multiplicity of flavors. Icing these is awesomely easy. Storing them, not as much. The icing does “harden” after about an hour or so, making storage much easier. If you have to stack the cookies to store or box them, parchment or wax paper is your friend between layers. If the cookies warm much beyond room temp, the icing will soften and make a mess, so the parchment or wax paper will help minimize it. I made two batches of this recipe, which yielded 9 four-ounce servings plus about two ounces. This is less than the yield stated in the recipe. It might have been because I kept taking out spoonfuls to “test” it. Possibly. Maybe. What? I had bacon. I stored the servings in Mason jars, which I decorated with ribbon and labels (same idea you see in the photos on the recipe website, but with a holiday design), and I gave them away as part of gift baskets I made for friends and family. No modifications except that I used sea salt for the salt called for in the recipe, because I like the stronger flavor and how it cuts the sweetness just enough. If you pour this into the Mason jars while the caramel is still hot, do not be alarmed if the jar lids “pop” as the caramel cools. This pairs beautifully with cookies, brownies, apple pie, ice cream and coffee. It also functions as a lovely dip for bacon. I hear. From a friend. It needs to be refrigerated if not used within a day (because of the dairy). When refrigerated, the sauce may separate but you should be able to shake it or stir it back into a whole. Serving at room temp is fine. If heating, I like to put the jar into a pot of simmering water for a few minutes. I’ve burned myself one too many times on sauces reheated in the microwave, so I’m bitter and old-school. Booze, sugar and holidays go together for me. Palate preference? Coping mechanism? Who’s to say? Po-tay-to, po-tah-to. But, sticking with my theme, I adapted this recipe for candied lemon peel to make it full of boozy, sugary goodness by making two important modifications. First, instead of using a vegetable peeler to remove the lemon peel, I cut the whole lemon in half width-wise. Then, I used a sharp paring knife to separate the fruit from the peel. I flattened the peel, then used the paring knife to remove most (but not all) of the pith from the rind. I then cut the peel length-wise into 1/8″ – 1/4″ strips. It is definitely more work, but I found it worth the effort. Instead of a papery slice of rind, you get a chewy, gumdrop-like bite that more closely resembles candy than jerky. Note that leaving some of the pith behind to get this result with the texture means that the peel will retain more bitterness. If you will eat the finished peels like candy, you may want to boil them down a third time if the bitterness is too much for you. Second, I substituted 1/4 cup of the cold water with 1/4 cup of cold rum (but any high-proof, clear alcohol would work). This infused the peels with a mild liquor flavor that, when combined with the sugar coating, gives the finished peels a flavor reminiscent of Limoncello. Be patient. It will take a long time for the sauce to develop into a syrup. I let mine go the full 60 minutes recommended in the recipe, but I cook on an electric cooktop. (NOT BY CHOICE!) If you are using a gas cooktop, cooking time may go faster. No matter what, though, keep an eye on the pot when you get about 30 minutes in. If the sugar starts turning darker to any degree, you are done cooking! Save the syrup after removing the peel. 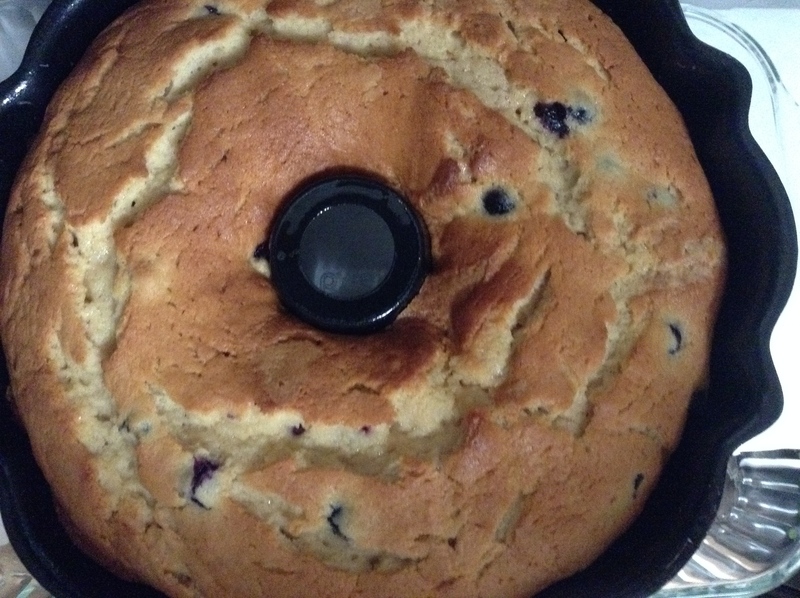 It is delicious in tea, over pound cake or added to a fresh-fruit salad. Keep it in the fridge. It will keep a long time. I did not use wax paper coated with cooking spray as suggested in the recipe. I just felt like I didn’t want any of that cooking spray soaking into the lemon peels and messing with the flavor. Instead, I used a dry piece of parchment. I did not have problems with sticking. Make sure the peels are still warm when coating with sugar (if doing this step). You will need more sugar than you think, because some of it will melt into the peels. You cannot possibly over-sugar the peels (remember: bitter pith) so don’t be afraid to pour it on. You can reserve the excess sugar, which will now be infused with a mild lemon flavor, for another use (but use within a few days or discard). I stored the finished peels in clear Mason jars. 7 lemons filled six 6-ounce Mason jars with 15 pieces of lemon peel with a few pieces left over for me! If you make any of these great treats, I’d love to hear about your experience – especially if you made changes to the recipe you think improves it!